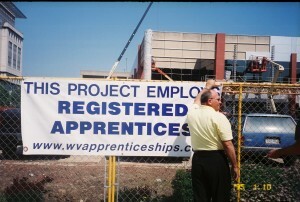 Welcome to the West Virginia Apprenticeship site. Our goal is to promote the apprenticeship system and provide current information on apprenticeship programs in West Virginia and surrounding areas. Apprenticeship is a combination of on-the-job training and related classroom instruction in which workers learn the practical and theoretical aspects of a highly skilled occupation. Apprenticeship is a proven system of training that benefits workers, companies and our communities. This site has a focus on construction apprenticeship because it is the most active area for programs. Use the “Find a Program” page to locate programs by County or by Craft.